Sometimes I make things or think things. Here they are. Nowadays, people are really into this whole “Skitch” thing, and being able to send images/screenshots to each other quickly. I’d been doing the same thing with TinyGrab for a long time, but I like to host things myself. Yes, TinyGrab has the ability to upload to your own server… but it uses FTP. This was causing me no end of issues, so I sought out something else. 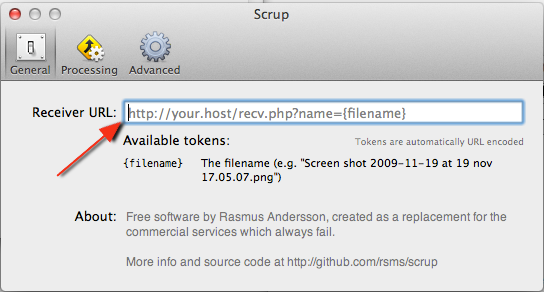 I found Scrup, and I’ve been using it for the last year or so very happily. It’s open source, and has been hanging around on Github for 2 years now. There are some pretty sweet forks of it, including one that has support for a sound on upload completion, and Growl notifications too. So, you need to share an image, or a screenshot really quickly? Using the standard OS X screenshot features (Command + Shift + 4, and so on), you can hit one button and upload the image to your webserver and put the link to it into your clipboard ready for pasting anywhere. Take screenshots! They should get uploaded and you should see a green tick in the menu bar. The URL of the uploaded image should also be in your clipboard, ready for pasting wherever. The best thing about Scrup is that it has a simple, fast UI for just uploading things quickly, and because it uses a regular HTTP POST, it works on whatever weird internet connection you may be on. I should’ve also mentioned: I tried Skitch, but the huge bulky UI bugged me. I love Scrup because it’s so small, the edit window is unobtrusive and you can switch it off completely if you want. I agree about the Skitch interface. They threw out every UI convention in existence. (That’s not a compliment.) I stick with it because I find the ability to quickly mark up a screenshot really really important. It’s amazing how useful it is to be able to draw a big red arrow sometimes. You might like Scrup then… Big red arrows are plentiful! Prerequisite it should be able to deploy it on LAN (php would be best) and nice Mac OS X client is added bonus.